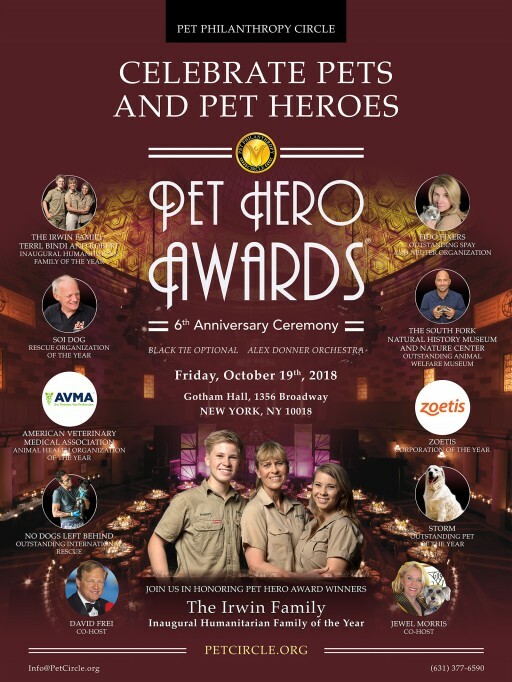 The 2018 Pet Hero Awards™ 6th Anniversary Ceremony will be held on Oct. 19 at Gotham Hall, 1356 Broadway, New York, NY. The event includes a cocktail reception, dinner and dancing but is much more than a delightful evening, it shines a light on people, organizations, corporations, veterinarians and pets that merit recognition for their dedication to animal welfare. This platform provides a networking opportunity for animal advocates to meet many of the world’s leaders and join forces in protecting the lives of animals. This year’s award winners include an all-star lineup including Bindi, Terri and Robert Irwin who will be receiving the Inaugural Humanitarian Family of the Year Award for their tireless commitment to saving animals across the globe. The Irwin Family is passionately dedicated to conservation and continuing Steve Irwin’s legacy as a wildlife force through their work with the Australia Zoo Wildlife Warriors. Through funding, education and research they are protecting wildlife and habitats around the world for generations to come. These humanitarians are Global Ambassadors for Discovery Communications and are currently filming a series of projects for Animal Planet. This optional black-tie event will be Co-hosted by David Frei, NBC Commentator and former Westminster Dog Show Host and Jewel Morris, Founder of the Pet Philanthropy Circle. This year’s Chair, Susan Cushing and Pet Philanthropy Circle’s President, Stephanie Mattera, invite all animal advocates to join us at this year’s celebration. Alex Donner Orchestra will provide musical entertainment again this year. For tickets and more information, visit PetCircle.org or call (631) 255-7911. Animal Health Organization of the Year is the American Veterinary Medical Association that has more than 91,000 members who protect, promote and advance the health and well-being of humans, animals, and the environment. Outstanding Pet, Storm, a golden retriever that is owned by North Shore Injury Lawyer, Mark T. Freeley, Esq., is the perfect role model of selfless rescue. Storm’s courageous act went viral. Over 9 million viewers saw the video of Storm jumping into treacherous water to save a drowning fawn. This dramatic moment was an inspiration for humans to jump in and save lives, no matter what species. Rescue Organization of the Year, Soi Dog Foundation, is the largest dog and cat welfare organization in southeast Asia. They have rescued and treated tens of thousands of street animals and have performed over 212,000 sterilizations. Soi Dog is also a leader in the fight against the dog meat trade, having virtually wiped out the industry in Thailand. Corporation of the Year, Zoetis, is the leading global animal health company providing medications in more than 100 countries. Their generosity in providing free medications to animals affected by hurricane disasters undoubtedly saved thousands of pet lives and prevented the spread of diseases as these animals were transported to safer locations. Outstanding Spay and Neuter Organization, Fido Fixers, founded by Lisa Wysocki, Suzanne Steinberg and Susan Maounis, is an all-volunteer organization, that provides low-cost spay and neuter services for dogs and cats in underserved and economically distressed areas in the United States. Outstanding International Rescue, No Dogs Left Behind, founded by Jeffrey Beri, is a global animal rescue organization saving thousands of dogs from a horrific life and ultimate slaughter at the hands of China’s dog meat trade. This group supports every stage of rescue from emergency response to final adoption via local resources and international alliances. Outstanding Animal Welfare Museum winner is the South Fork Natural History Museum and Nature Center. This family-friendly destination is an exploration and discovery exhibition complex and park for all ages. Its training programs stimulate interest and foster appreciation for animals and the environment. We invite all members of the press to cover this event and email Info@PetCircle.org to receive your press pass.